Westwood Eyecare & Optical is now celebrating its 30th year! A local hometown business with metropolitan flair, we combine comfort and quality of service with chic and stylish products. We pride ourselves on supporting the local community. Throughout the years we have made contributions to many community endeavors including the Westwood education system, youth sports, veterans, performing arts, police and fire departments, and many more! Dr. Zahka is a board certified, diplomate of the American Board of Optometry. Dr. Zahka is the Secretary of the Massachusetts Licensing Board for Optometry. He was recommended for the position by the Massachusetts Society of Optometrists and appointed by Governor Patrick in June 2010. He is a founding member, and serves on the Board of Directors for the non-profit, Massachusetts Vision Foundation. He is also a 30 year member of American Optometric Association, serving as a delegate to the AOA national congress,and a past member of the nominating committee. He has served on the Advisory Board of Tufts Health Plan and serves as a member of the Executive Board at his local church. Dr. Zahka is a graduate of Boston University, and the New England College of Optometry. He has been providing the highest quality, Optometric care for his patients since 1984. He is a Westwood resident, and an active supporter of local sports teams,theatre, education, and many other local activities. Additional information about the MSO and the AOA can be found at http://www.massoptom.org/ and http://www.aoa.org/. Watch Dr. Zahka on the news! Dr. Lavallee earned his Bachelor of Science in Biology at Boston College. He then went on to study at the New England College of Optometry, where he was a distinguished presidential scholar and a member of the Beta Sigma Kappa Optometric Honor Society for four years. While attending the New England College of Optometry, Dr. Lavallee had internships in a variety of medical settings, where he focused his studies on comprehensive eye examinations, contact lens fittings and ocular disease. Dr. Lavallee is excited to be a part of the Westwood Eye Care & Optical team and is dedicated to going above and beyond to provide his patients with excellent Optometric care. 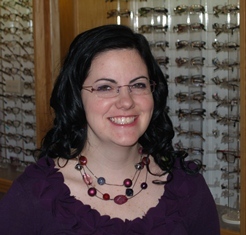 Kathy is a Registered Dispensing Optician with over 15 years of experience. Kathy will assist you with your eyewear selection process, taking great care that your frames and lenses will be aesthetically pleasing while providing you with optimal vision. She will explain the benefits of the options you've chosen. When you receive your eyewear, Kathy will ensure a proper, comfortable fit and explain in detail how to care for your new eyewear. Joni has been welcoming patients to our office for the past 8 years. She is passionate about eye care and dedicated to the well being of all our patients. Joni will be happy to help you schedule an appointment for your comprehensive eye exam, contact lens evaluation, or specialty examination. Her experience with health insurance ensures that our patients are receiving their maximum allowed benefits. Margaret is one of the first people to greet you at Westwood Eye Care & Optical. She is happy to schedule an appointment for your comprehensive eye exam, contact lens evaluation,or specialty examination. To enhance your experience with us Margaret contacts your insurance company for you to verify your coverage and determine which benefits are available. She has years of experience in health care and has been our Pretest Technician for over 5 years.